The latest Avengers: Endgame TV spot offers some new footage of Earth's Mightiest Heroes as they prepare for battle. The press tour for the highly anticipated sequel is under way and it's been pretty entertaining to see the cast try and talk around the movie while being incredibly careful not to leak anything. Endgame producer Trinh Tran recently revealed that the whole movie is practically one big spoiler, so it has to be really hard to avoid the subject while promoting it at the same time. 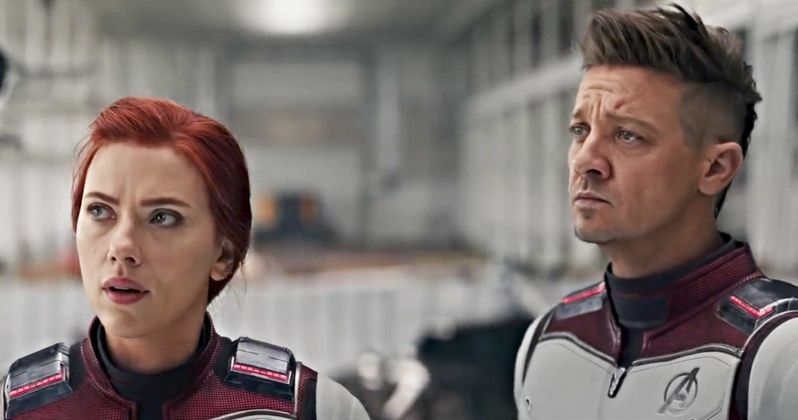 The Avengers: Endgame TV spot shows off the white suits, which have been unofficially dubbed the Quantum Realm suits. Captain America is offering a speech as we see new footage of Rhodey and Nebula, Tony Stark, and some new dialogue from Rocket and Ant-Man. Cap confirms the group is going to break into teams, though it is unclear how they are divided. However, from set pictures and other footage from the movie, it looks like Iron Man, Cap, and Ant-Man are going to be together, while Nebula, Rhodey, and Rocket will be a team. That leaves Black Widow, Hawkeye, and Bruce Banner with Captain Marvel. As for breaking up into teams, it isn't clear why they are doing so, but it has been heavily rumored that Avengers: Endgame will utilize time travel through the Quantum Realm. With that being said, it is believed that the teams will go through time, looking to steal the Infinity Stones in order to reverse the Decimation. The latest full clip from the movie indicates the plan is to go get the Stones from the Mad Titan, but plans may have to change, even with Carol Danvers on their side. The Russo Brothers have been doing an excellent job at keeping everything about Avengers: Endgame under wraps. Marvel Studios boss Kevin Feige has said all of the promotional material released thus far has all come from the first 30 minutes of the 3-hour and 58-second movie. In addition, the Russos have admitted to using footage that isn't even in the final cut to throw fans off from figuring anything else out. We're all waiting for Mark Ruffalo or Tom Holland to come through with a leak. Mark Ruffalo seems to have learned his lesson over the years. When Avengers: Endgame went into reshoots, the actor took a break from social media and has since made a return, careful not to give fans too much information. There are only a couple of weeks left until the movie hits theaters, which means there is still time for Ruffalo to slip up. But for now, we have the new Avengers: Endgame TV spot to pick a part and examine while we wait. You can check out the TV spot below, thanks to the Marvel Entertainment YouTube channel.